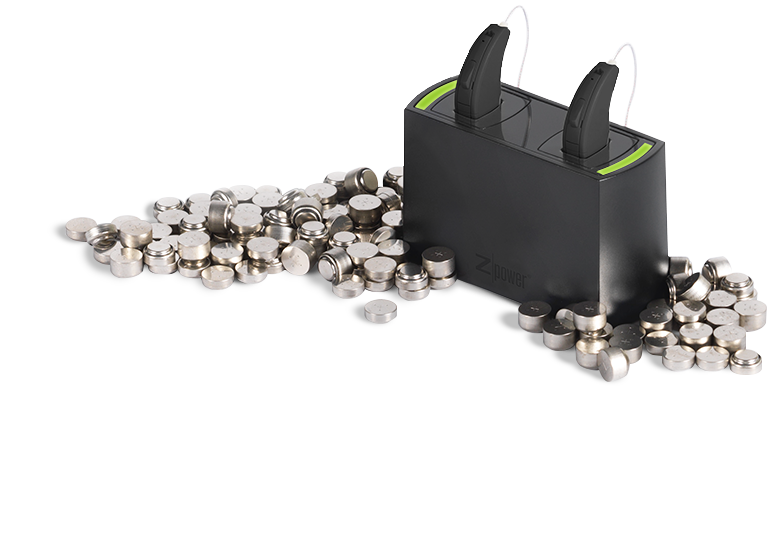 Hearing loops bring a new and improved listening experience to hearing aid users by reducing the amount of background noise and increasing the quality of the sound you want to hear. A hearing loop system is a type of assistive listening technology where a wire is connected to a sound system through an amplifier that distributes sound throughout the room. The loop connects wirelessly with the telecoil feature of the user’s hearing aid to produce improved sound quality. Traveling directly to the hearing aid, the user can more clearly hear a speaker at the front of the room, a performance or movie in a theater, announcements in an airport, or even their own television sets. The hearing loop eliminates unnecessary background noises that are typically picked up by hearing aids. With a loop, hearing aid users experience audio quality as if they were sitting right next to the presenter or performer. Former barriers such as acoustics, background noise or distance from the speaker are no longer prohibitive factors with hearing loops. The hearing aid’s telecoil – a small copper coil available in many units – works as a wireless antenna linking to the sound source, delivering high-quality sound to the listener. Some cell phones and all landline phones are designed to be used with a telecoil. 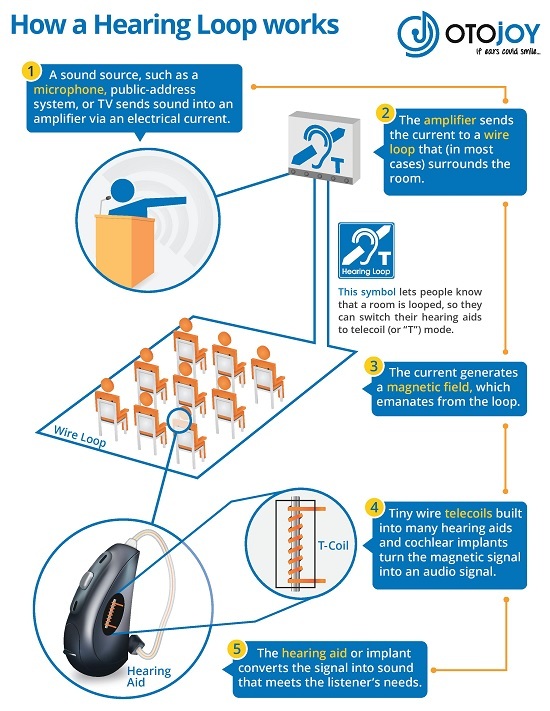 Once the t-coil feature has been programmed into the hearing device, the user simply needs to switch their hearing aid or cochlear implant to the “T”, telecoil, or hearing loop program. No additional receiver or equipment is typically necessary. If the hearing aid does not have a telecoil, you’ll require a headset connected to a loop receiver or purchase an accessory that enables your hearing aids to access the telecoil to get the same effect. Listeners getting their first hearing aid should be sure a telecoil is included with the instrument. The technology can improve your listening experience in a growing number of environments. Unlike other assistive listening technology options – such as FM/RF systems and infrared technology – a hearing loop doesn’t require bulky headset receivers from the user or venue. The user simply presses a button on their own hearing device, instantly connecting them with an audio stream directly from the sound system. This technology helps create equal access for those with hearing loss, providing them more independence. There are a growing number of locations using hearing loops. Here are some locations with installed systems in the Mason City, Northern Iowa and Albert Lea, Minnesota. Hearing Associates waiting room in Mason City: The TV is looped so customers can experience the benefits of a loop firsthand. To learn more about hearing loops, activate the T-switch on your hearing aid or schedule an appointment online at Hearing Associates or call us at 888-760-2032. Image courtesy of OTOjOY, click image to enlarge. Many people don’t realize the far-reaching health implications of untreated hearing loss. Research shows that people with moderate to severe hearing loss are five times more likely to develop dementia than peers with normal hearing. Even individuals with mild hearing loss are nearly twice as likely to experience cognitive decline and dementia than those without a hearing impairment, while the risks are three-fold for people with moderate hearing loss. A study at Johns Hopkins University tracked brain changes in 126 people over the course of a decade. Each participant completed a hearing test, and the results revealed 75 people with normal hearing, and 51 people with impaired hearing of at least a 25-decibel loss. Hearing impaired participants at the start of the study had accelerated rates of brain tissue loss when compared to those with normal hearing. Those with impaired hearing lost more than one additional cubic centimeter of brain tissue each year when compared to participants with normal hearing. The impaired hearing group also had significantly more shrinkage in regions of the brain responsible for processing sound and speech. Further studies have shown how hearing loss can lead to a brain overload situation, where the brain works harder to simply understand speech. Over time, this extra work drains the brain of the mental energy needed for other important functions such as thinking and remembering, laying the groundwork for Alzheimer’s or dementia to develop. There is also a socialization component of untreated hearing loss. If people can’t communicate effectively with others, they tend to withdraw from relationships and can end up feeling isolated, anxious and depressed. Fortunately, research also shows that treating hearing loss with hearing aids can slow cognitive decline and help prevent dementia. By improving listening experiences, hearing aids can also improve an individual’s social capabilities, independence, emotional health and overall quality of life. Early intervention is important for treating hearing loss. By scheduling a hearing exam at one of our audiology offices in northern Iowa, you can take action against dementia and preventable brain tissue loss. Contact us today to find out how. Hearing loss is caused by long-term or sudden noise exposure or damage to the auditory nerve or auditory hair cells, which results in the impaired ability to hear and understand speech. But hearing loss affects more than just your hearing; it affects your entire well-being. Hearing loss has been linked to several life-threatening illnesses, including diabetes, heart disease and kidney disease. The condition can affect mental health too, often leading to depression, dementia and Alzheimer’s. And, because of the strong link between inner-ear function and balance, hearing loss puts you at risk for falls that result from dizziness and vertigo. Hearing loss can also be related to the use of certain ototoxic medications. Hearing loss also distances you from your loved ones, making it difficult to maintain close relationships. The condition can get in the way of your career as well. You may appear incompetent to your peers when the reality is that you’re having difficulty hearing, not understanding. All things considered, hearing loss puts you at a significant disadvantage. We offer hope and the possibility of a life free from hearing loss. Let the experienced audiologists at Hearing Associates, P.C. help you hear what you’ve been missing.